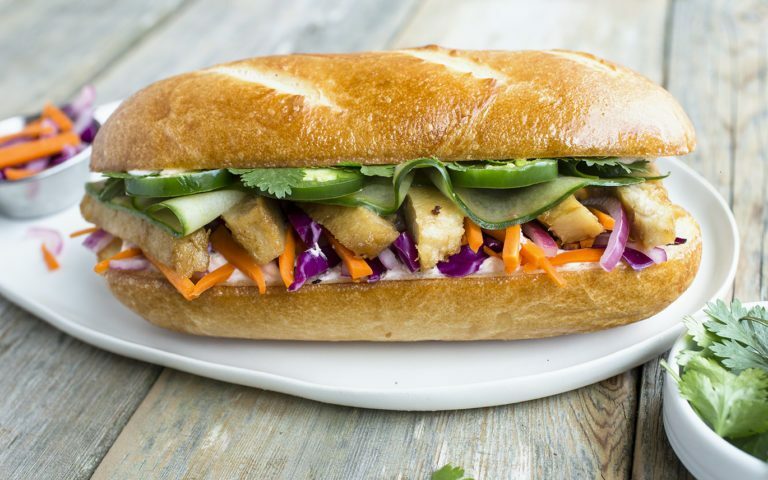 French baguette layered with Sriracha mayo, marinated Chickenless Breast and pickled veggie slaw garnished with thin-sliced cucumber, jalapenos and fresh cilantro. Drizzle Sriracha mayonnaise over top and bottom halves of open-hinged French baguette. Top evenly with Pickled Veggies. Diagonally-slice Sesame Soy Marinated Chickenless Breast. Arrange over bottom half of baguette. Top with cucumber ribbons, jalapeno slices and cilantro sprigs. Serve with additional Sriracha mayonnaise. Combine rice vinegar and sugar in bowl and whisk to blend. Add carrots and red onions. Let stand at room temperature for 30 minutes, tossing occasionally. Drain veggies. Add shredded cabbage and toss to blend. Cover and refrigerate to hold. Place Chickenless Breasts on a sheet pan. Bake in a preheated convection oven at 450°F for 10 minutes. Combine soy sauce and sesame oil. Brush evenly over breasts. Return sheet pan to oven and heat an additional 3 to 4 minutes, or until fully heated and golden brown. Keep warm for service. Zesty Chipotle Black Bean Burger topped with blue cheese crumbles, crispy fried onions and tangy buffalo sauce. Pre-heat the oven to 450 degrees. Place burger on an unlined sheet pan and bake for 9 minutes, flip and bake for 8 more minutes or until crispy. To assemble, spread the mayonnaise on the cut side of the bottom bun. Top with lettuce, tomato and pickle, then place a burger on each. 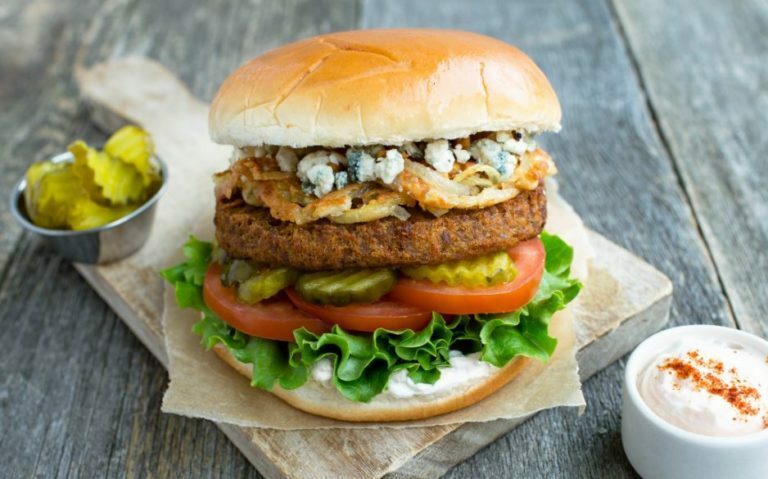 Top the burger with crispy onion, blue cheese and a drizzle of buffalo sauce before adding the top bun. 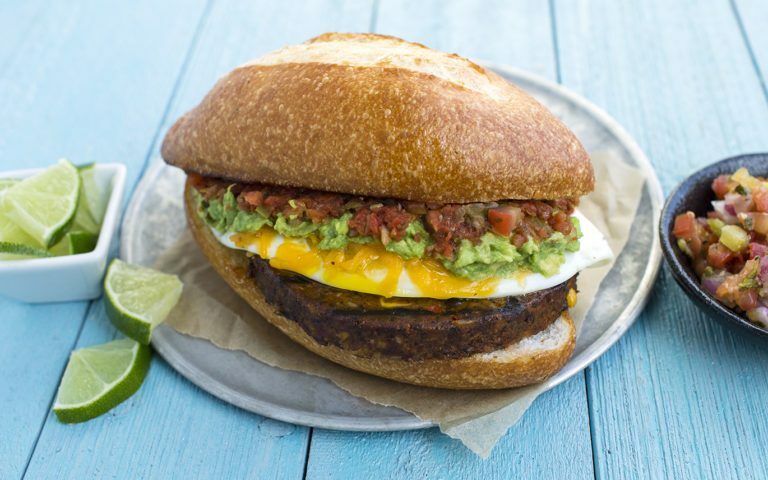 Mexican-inspired vegetarian breakfast sandwich features a smoky grilled Chipotle Black Bean Burger layered in a crusty bolillo roll topped with a fried egg, melted Jack cheese, smashed avocado and roasted salsa. Grill-mark Chipotle Black Bean Burger on an oiled grill. Transfer to oiled flat top grill at 425°F, season and cook for 7 minutes, or until fully heated, flipping as necessary. Cook egg to-order on oiled flat top grill. Top with shredded cheese and heat briefly to melt. Layer Chipotle Black Bean Burger on bottom half of bolillo roll. Top with egg, cheese, smashed avocado and red chili salsa. Close with top half of roll. 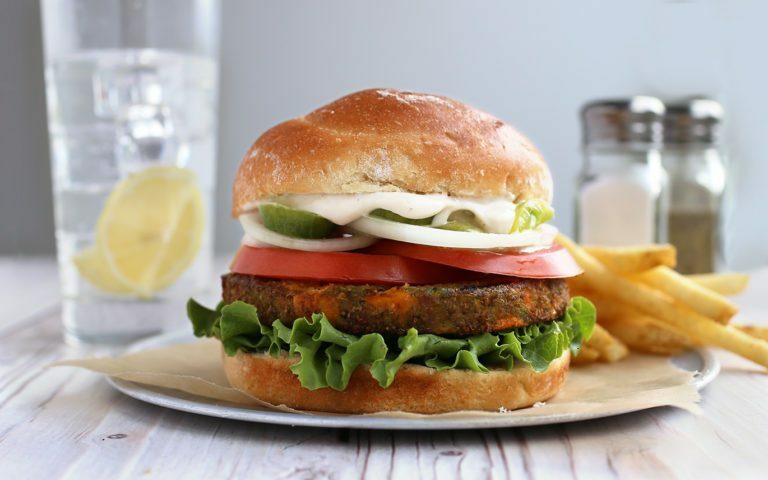 Sizzling-hot grilled California Veggie Burger topped with crispy fried green tomatoes, a drizzle of buttermilk ranch dressing and sliced Vidalia onion. Transfer to oiled flat top grill at 425°F, season and cook for 7 to 10 minutes, or until fully heated, flipping as necessary. Layer lettuce, tomato, Vidalia onion and California Veggie Burger on bottom half of bun. Top with fried green tomatoes and ranch dressing. Close with top half of sandwich. 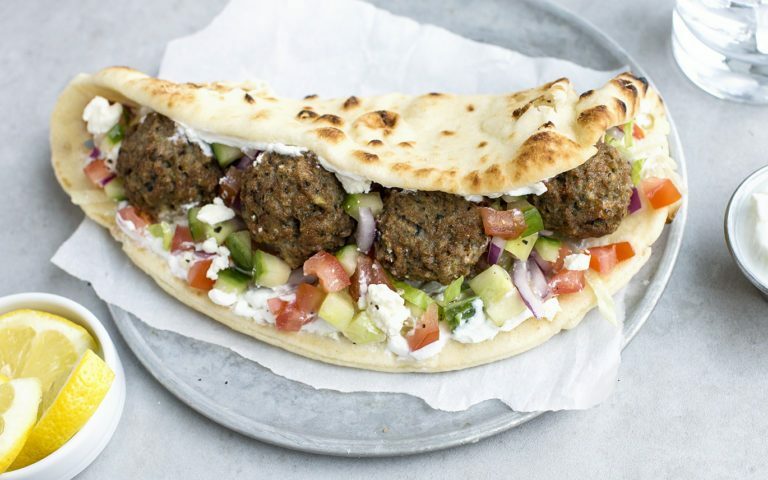 Warm pita bread wrapped around sizzling-hot Mediterranean Soy Meatballs with Greek tzatziki sauce, crisp shredded lettuce, red onion, cucumber, tomato and crumbled feta cheese. Spread 2 tablespoons tzatziki sauce evenly over inside of pita bread. Layer lettuce, cucumber, tomato, red onion, Mediterranean Seasoned Soy Meatballs and feta cheese on bottom half of pita flatbread. Fold closed and serve warm plated with a ramekin of tzatziki sauce. Place meatless soy balls on a sheet pan. Bake in a preheated convection oven at 450°F for 10 to 15 minutes, turning once. Transfer meatless soy balls to a half-size steam table pan. Add olive oil and Greek seasoning and toss to evenly coat. Keep warm for service. Melty cheese-topped California Veggie burger with fresh tomatoes, baby arugula and pesto between two brioche buns. Pre-heat the oven to 450 degrees. Place the burger on an unlined sheet pan and bake for 9 minutes, flip and bake for 8 more minutes or until crispy. Make the sauce by whisking together the pesto and mayonnaise. Set aside. To assemble, place the baby arugula on the cut side of the bottom buns. 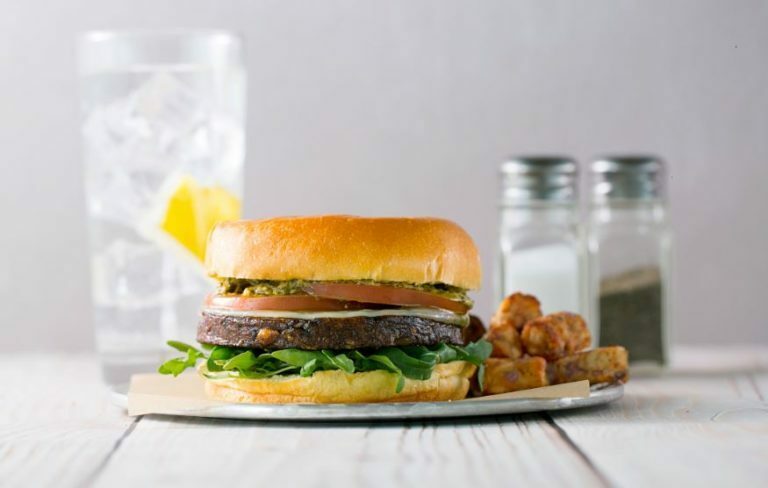 Top with burger, sliced tomatoes and a drizzle of pesto mayonnaise before adding the top bun. 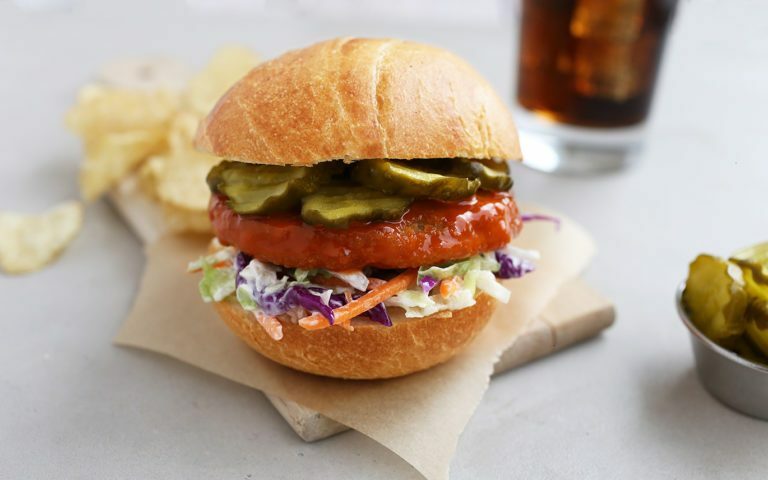 Crispy Chickenless Patty doused in spicy Cayenne Pepper Glaze, crisp shredded slaw and dill pickle. Deep fry Chickenless Patty at 350°F for 3 minutes, or until fully heated and golden brown. Drain. Brush glaze over both sides of patty. Layer slaw on bottom bun half. Top with glazed Chickenless Patty and dill pickle chips. Close with top half of bun. Cover and chill. Hold at room temperature for service. Whisk to blend glaze for use. Rustic flatbread featuring Crispy Chickenless Tenders with hot-and-spicy Buffalo wing sauce. Finished with a choice of ranch or blue cheese dressing. Deep fry Tenders at 350° for 1½ to 2 minutes, or until fully heated and golden brown. Drain. Combine Chickenless Tenders and 2 tablespoons Buffalo wing sauce in bowl and toss to coat. Top flatbread evenly with shredded cheese, Buffalo sauce tossed Chickenless Tenders and crumbled blue cheese. Bake at 400°F for 10 to 12 minutes, or until cheese melts and crust is golden. 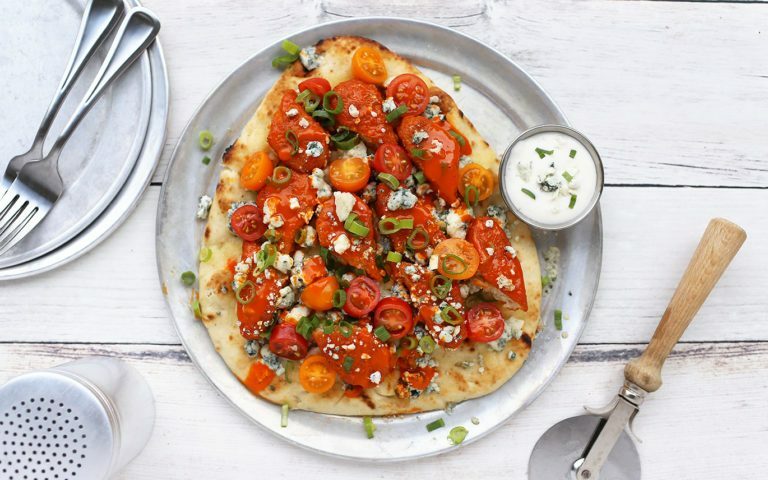 Top flatbread with grape tomatoes, drizzle 2 tablespoons Buffalo wing sauce and green onions. Slice flatbread into rustic cut pieces. Serve accompanied with a ramekin of dressing. Western-style Chipotle Black Bean Burger on a brioche bun fully loaded with pepper jack cheese, onion rings, smoky BBQ sauce and more. Pre-heat the oven to 450 degrees. Place the burger and the onion rings on an unlined sheet pan and bake for 9 minutes, flip and bake for 8 more minutes or until crispy. Top burger with cheese and return to oven until melted, about 1 minute. To assemble, place the lettuce on the cut side of the bottom buns. 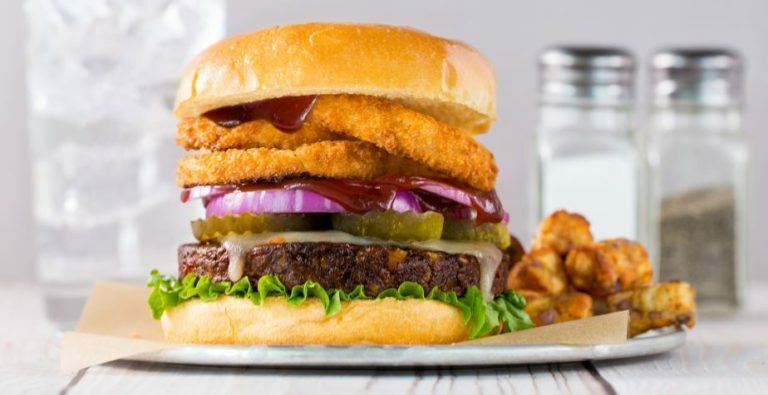 Top with the burger, pickle slices, red onions and onion rings, then add a drizzle of bbq sauce before adding the top bun.